"Cataclysm" redirects here. For the in-universe event that is the subject of the expansion, see Cataclysm (event). For the warlock talent, see Cataclysm (warlock talent). World of Warcraft: Cataclysm (or Cata for short) is the upcoming third expansion for World of Warcraft and was officially announced on August 21, 2009 at BlizzCon 2009. The majority of the expansion content takes place in drastically reforged Kalimdor and Eastern Kingdoms. It is to include the playable races of the worgen for the Alliance and the goblins for the Horde. Flying mounts will finally be usable in Kalimdor and Eastern Kingdoms. Deathwing will make his return into Azeroth from Deepholm, causing a new Sundering. World of Warcraft: Cataclysm will be released in 2010. The Friends & Family phase of the World of Warcraft: Cataclysm alpha began on May 3rd, 2010. Closed beta began June 30th, 2010. Level cap increased to 85. Zones are drastically affected by the Cataclysm in Kalimdor and Eastern Kingdoms. The Barrens has been split into two, and is full of canyons of lava. Wetlands is destroyed, Ashenvale hit as well. The Maelstrom churns. The changes will be made available to all players regardless of expansion purchase. all classes, except for shaman and paladin. all classes, except for druid and paladin. New race/class combinations. See the chart below. (These will be available only to those who have purchased the expansion). New monsters, quests, and zones. New dungeons, raids and battlegrounds. Guild advancement system, which includes guild leveling, achievements, and rewards. Ability to fly anywhere due to the Azeroth revamp. 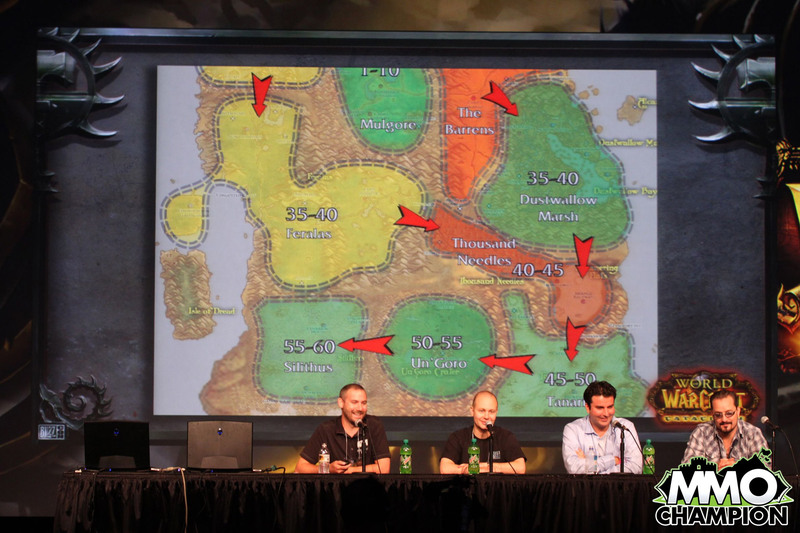 The blood elf and draenei starting zones will still be instanced. Cataclysm will have support for new DirectX 11 features. Cataclysm will have hardware cursor in OpenGL mode. MP5 and spirit: MP5 is being removed, all healing specs will rely on spirit for mana regeneration, with the rate affected by the Meditation passive talent tree bonus. The 5 second rule may be removed, with "in combat" and "out of combat" mana regeneration based on whether characters are in or out of combat. Spell DPS classes will no longer rely on spirit for mana regeneration, and spirit will no longer be on cloth spell DPS gear. Balance druids and elemental shamans will get talents to gain hit rating from spirit to allow them to share gear with healers and leather and mail caster gear will no longer have hit rating. Shadow Priests will also have hit conversion on one of their talents in order to make it easier for them to gear up through more options. Defense is being removed from the game, including both defense rating and the defense skill. All tanking specs will get anti-critical hit talents similar to Survival of the Fittest. Profession level cap raised to 525 and will be named Illustrious <Profession>. Selecting a primary talent tree, is required at level 10 and must be done before talent points can be spent. This will provide passive bonuses and a unique active ability. You will be unable to spend talent points in a secondary tree until you have invested 31 points in your primary tree (at roughly level 70). 25-man raid leaders will have the possibility to split down the raid into a maximum of three 10-man raids. This is to allow players to continue a raid even if someone has left the group. 10-mans cannot, however, be converted into a 25-man raid. 10- and 25-man raids will share the same ID in Cataclysm. However, players will still be able to join any raid as long as they don't kill the same boss twice in the same lockout. This means players will be able to continue a raid with a different group at the condition the new group is the same point or beyond the invited player. 10- and 25-man raids in Cataclysm will give the same Loot, the 25-mans will give more Loot per character. There will only be four different "badges" in Cataclysm, now all called Points: two PvE (Hero and Valor Points) and two PvP (Honor and Conquest Points). Arena Points are now called Conquest Points. PvE Hero Points and PvP Honor Points will only have a cap on the total number of points you can accumulate. PvE Valor Points and PvP Conquest Points will have a cap on the total number of points, as well as a cap on the maximum amount of points you can earn in a week. Cataclysm will include a new "auto-quest" mechanic, allowing players to pick up the next quest in a chain without having to go back to the original quest giver. Revamped character progression via the Paths of the Titans, and Ancient glyphs was planned and announced, but later cancelled. Guild talents and guild currency have been removed. Instead, guild advancement bonuses are automatically unlocked based on guild level. Deathwing, formerly Neltharion the Earth-Warder, confirmed as the principal villain of the expansion. Garrosh Hellscream, who becomes the Horde's acting Warchief, continues to cause internal tensions in the Horde. Varian Wrynn, who leads the Alliance after the Cataclysm. Malfurion Stormrage, who returns to prevent Mount Hyjal from being destroyed. Brann Bronzebeard, up to his old tricks as leader of the expedition into the newly-uncovered Uldum region. Genn Greymane, King of Gilneas, who helps administer a cure for the worgen curse to his now-transformed people. Nefarian, also known as Victor Nefarius, son of Deathwing, who survived and retreated further into Blackrock Spire. Ragnaros, who remains alive to challenge the world in Mount Hyjal, and later in Sulfuron Keep in his own realm, the Firelands. Queen Azshara makes an appearance in a small but important role as Malfurion Stormrage's adversary. Therazane aids adventurers in Deepholm. Numerous new factions are introduced in the expansion. The people of Gilneas are a nation of survivors. Having walled themselves off from the rest of humanity, they must now face new threats from within. The Guardians of Hyjal is a group tasked with defense of Mount Hyjal, besieged by Firelord Ragnaros' armies. Guardians are made up mainly of druids, much like Cenarion Circle. The cat-people of Ramkahen are the distant but direct descendants of the Tol'vir, guardians of Uldum. Though they've lost their stone bodies, protecting the secrets of the Titans is still a part of their rigid tradition. Dragonmaw clan in the Twin Peaks battleground. Wildhammer clan in the Twin Peaks battleground. Maps of the new zones in Cataclysm (enlarged). For detailed zone changes in the current beta patch, see Patch 4.0.0 (undocumented changes). These changes are not phased. They will be seen by everyone, from level 1 to 85, whether or not they buy the expansion. Ashenvale: Heavier deforestation around the Warsong Lumber Camp causes the orcs to encroach on Silverwind Refuge. Zoram'gar Outpost is reinforced with black iron, similar to the Horde outposts in Northrend. Astranaar becomes the victim of air assaults launched by the Horde. Azshara: Azshara has been claimed by the goblins (likely as their second zone after the Lost Isles), where they have established a quarry to cut stone for the construction of their towns. The zone is also now directly linked with Orgrimmar. Darkshore: Auberdine is destroyed, and the very land torn asunder. The Alliance relocates to a new town in the northern end of the zone called Lor'danel. Shatterspear Village, previously a closed zone, becomes an accessible subzone. Darnassus: The "worgen district", previously believed to be in Stormwind, will in fact be in a section of Darnassus. The architecture is described as "buildings that look like they’re built out of trees but they’re Worgen-style, so they’re dark and spooky – they fit the Gilneas style". Desolace: Once a barren wasteland, the Cataclysm has caused a rift to form, allowing water to flood in from the coast and bring life back to the region. However, the region is now being invaded by demons, including shivarra. Durotar: The Darkspear Trolls will retake the Echo Isles as a new starting area. The Exodar: The boat at Valaar's Berth will have a direct connection to Stormwind Harbor. Feralas: Will be retuned to a 35-40 zone. Feathermoon Stronghold has been razed by Naga. The Isle of Dread has been flooded by tidal waves caused by the Cataclysm. Orgrimmar: The trailer showed evidence of the front gates being reinforced with metal (like Warsong Hold). What metal is used is unknown, but at BlizzCon 2009 Tom Chilton said specifically "if you recognize the black iron... it's from somewhere", hinting that the metal has a specific origin or just reinforcing that we saw this type of architecture used by Garrosh in Northrend. Possibilities include dark iron, saronite or just normal iron. The Valley of Wisdom will become a tauren district, and Garrosh - now acting Warchief of the Horde - will build a new fortress in the Valley of Strength "to show who is in charge". There will also be a district known as the "Goblin Slums" near the Valley of Spirits. There is also a rear gate leading to Azshara. The Valley of Honor will also become the second trade district, with its own bank, auction house and inn. Stonetalon Mountains: Eruptions decimate the landscape, spreading the flames of the Charred Vale even further. The goblins have cut through the mountains, forming a valley that leads into Ashenvale. The western coastline is now accessible. Stonetalon Peak has been destroyed by Faceless Ones and Old God tendrils. Tanaris: Will be flooded, with Gadgetzan becoming beachfront property; Steamwheedle Port is destroyed and populated with homeless Goblins. Thousand Needles: Will be flooded, with the eastern coastline accessible and the Shimmering Flats becoming a lake; it will be returned as a level 40-45 zone. Razorfen Downs has been moved to the Thousand Needles map from the Barrens map -- no new dungeons in this zone. Blasted Lands: The quest flow for the entire zone is being revamped, with the coastline being made accessible and the Tainted Scar gaining a large, worgen-themed area. Dun Morogh: The Gnomeregan Exiles will retake Gnomeregan as a new starting area. Eastern Plaguelands: Will be retuned as a level 40-50 zone. The Hinterlands: Will be retuned as a 30-35 zone. Hillsbrad Foothills: Although originally stated by the developers to have been destroyed by tidal waves, Southshore has actually been destroyed by the Forsaken Blight. Silverpine Forest: The Greymane Wall has been destroyed by the Cataclysm, opening up the passage to Gilneas. Stormwind City: The castles and terrain surrounding Stormwind City have been remodeled to accommodate flying mounts. Parts of the city have been damaged. The Park has been obliterated by Deathwing in retaliation for Varian displaying Onyxia's head from the arches. A new lake area and a city cemetery have been established, and the Dwarven District will also become the secondary trade district, with its own bank, auction house and inn. Stranglethorn Vale: Will be one of the most heavily revamped zones. Tirisfal Glades: Brill has been updated with a new Forsaken architecture seen in Northrend. Undercity: The terrain in and around the Ruins of Lordaeron has been remodeled to accommodate flying mounts. Western Plaguelands: After the Lich King's downfall, the Scourge are easily subjugated, resulting in Felstone Field, Dalson's Tears, The Writhing Haunt and Gahrron's Withering to be rebuilt. Portions of Andorhal are claimed by the Alliance and Horde. Hearthglen has now become a home for the Argent Crusade lead by Tirion Fordring; he has been removed from his shack in Eastern Plaguelands. Western Plaguelands will be re-tuned as a level 30-40 zone. Westfall: A vortex is present in the area, Sentinel Hill will be surrounded by a wall. Other effects are currently unknown. Wetlands: Heavily affected by Deathwing's destructive exit from Deepholm, with the Twilight Highlands now opened to the East. The developers announced at BlizzCon 2009 that they intend for Cataclysm to ship with the most end-game content yet seen in an expansion. Throne of the Four Winds, a raid instance. Throne of the Tides, level 80-81 dungeon. Halls of Origination, level 85 dungeon. Blackwing Descent, raid inspired by Blackwing Lair with Nefarian as end boss. Bastion of Twilight, a raid instance. Revamps of the old world dungeons. Raid against Ragnaros. Originally planned for release, but pushed back for unknown reasons. War of the Ancients, a raid instance. Battle for Gilneas City will be a new battleground in which you take control of the city by taking control of the most districts in the battleground. Twin Peaks will be a CTF battleground located in Twilight Highlands, similar to Warsong Gulch. Battlegrounds starting with Cataclysm will be rated, like arenas, and will provide the same rewards as arenas. New arenas are planned to be added with the expansion, but not directly at the release. Tol Barad will be an outdoor PvP zone much like Wintergrasp. Unlike Wintergrasp however, Tol Barad will also be the main daily quest hub in Cataclysm. By taking control of the Tol Barad Prison, players will gain access to additional, very profitable daily quests. Thousands of players have received e-mails inviting them to join an "alpha test". These are scammers who are looking to capitalize on unsuspecting victims. Blizzard does not invite the general player base to alpha tests. It has an army of game developers and testers for that. As with the previous two expansions, beta testing will be announced by Blizzard on the official World of Warcraft website. Beware of clicking official-looking links to that site in e-mails, as scammers often build official-looking copycat sites - instead bookmark the official site or use the link on the game login screen. It cannot be stressed enough to players that Blizzard will never ask you for your credit card, password, user name, e-mail address or any other information it already has. This will not happen ingame, nor in e-mail. If you are asked for this info, you are being scammed. Now that the Cataclysm beta test has begun, scammers have begun sending emails advertising beta access. Beta access will always be made available through your battle.net account, and you will be notified through the email address used to create that account. To be sure an email offering beta access is legitimate, do not follow links in the email; instead, go directly to the account management website (where if the email notification was legitimate, you will be able to download the beta client). There is a thread in the official forums by MVP Frejya about what to expect from Blizzard. ↑ 1,0 1,1 Slide Presentation - Fourth Quarter and CY 2009 Results (PDF). Activision Blizzard. Retrieved on 2010-02-11. ↑ Cataclysm Alpha has begun!. MMO-Champion. Retrieved on 2010-07-01. ↑ Blizzard Entertainment Begins Closed Beta Test for World of Warcraft®: Cataclysm™. Activision Blizzard. Retrieved on 2010-06-30. ↑ YouTube - Cory Stockton Interview - Cataclysm - BlizzCon 2009. ↑ Bouboille 2009-08-22. Class Discussions Panel. MMO-Champion. Retrieved on 2010-02-11. ↑ Bouboille 2009-08-22. Blizzcon Day 2 - Game Systems Panel. MMO-Champion. Retrieved on 2010-02-11. ↑ Bouboille 2009-08-22. Blizzcon Day 2 - Open Q&A Panel. MMO-Champion. Retrieved on 2010-02-11. ↑ Ghostcrawler 2009-11-18. Questions about Feral Tank in Cataclysm. MMO-Champion. Retrieved on 2010-02-11. ↑ Ghostcrawler. World of Warcraft - English (NA) Forums -> Pets, Scaling, And 3.3. Archived from the original on 2009-10-08. ↑ Eyonix. World of Warcraft - English (NA) Forums -> Cataclysm Stat & System Changes. ↑ Ghostcrawler 2009-10-29. Icewell Radiance is in!. MMO-Champion. Retrieved on 2010-02-11. ↑ World of Warcraft: Cataclysm - Features. ↑ Tracey John 2009-08-25. Q&A: How Cataclysm Will Change WoW Forever. Wired.com. Retrieved on 2009-08-28. ↑ cataclysmpreviewpanel_046.jpg (JPG). MMO-Champion. Retrieved on 2010-02-11. ↑ 35,0 35,1 Daniel Whitcomb 2009-09-27. Cataclysm starting zone lore and other new details revealed. WoW.com. Retrieved on 2010-02-11. ↑ Andrew Powers 2009-07-16. World of Warcraft scam alpha test. Retrieved on 2009-08-20.